My brother-in-law works with a man whose mother-in-law passed away a few years ago. The man’s wife has been distraught since the loss of her mother and has saved the last chore of cleaning out her mother’s sewing room until now. She needed to find a place to take her mother’s fabrics where they would be used in a meaningful way. So my brother-in-law mentioned me to his co-worker which was really very nice of him. After a phone call from the wife where I explained my involvement with some quilting groups, I received this donation of her fabric collection. What incredible generosity! As I worked my way through the bins I pulled out this little cutie and knew instantly it could be used as a backing for a quilt top I had completed a long time ago. The quilt top sat around for the exact reason that I did not know what to use for backing. As soon as I saw this fabric I knew it was a perfect match. It was very rewarding to know that I was going to be able to do some good rather quickly with one of the fabrics. I even found a nice tan fabric piece to use for binding. I can’t wait to quilt this one. The bins contain some quilts that have been started and I am certain that some of the ladies at the senior center would love the challenge of completing those started projects. My friend Sue will be coming over tomorrow to see what she can use for her charity projects and she will help me decide which groups would benefit from these fabrics. Between Quilts for Kids, the Veterans quilts, the Hope House quilts, the church group quilts and the senior center quilts, I am very sure nothing will get left behind. I cannot thank the generous donor enough for her thoughtfulness and I hope she knows her mother’s legacy will live on through the comfort that these will give to someone. I ordered some fabrics and patterns from a new shop. When I say new I mean new to me, not that it hasn’t been around for a while. I really wanted to get a pattern called Churning Fourteen and this is where I found it. I absolutely had to peruse the shop once I had the pattern in my cart and I ended up with a few fabric bundles. 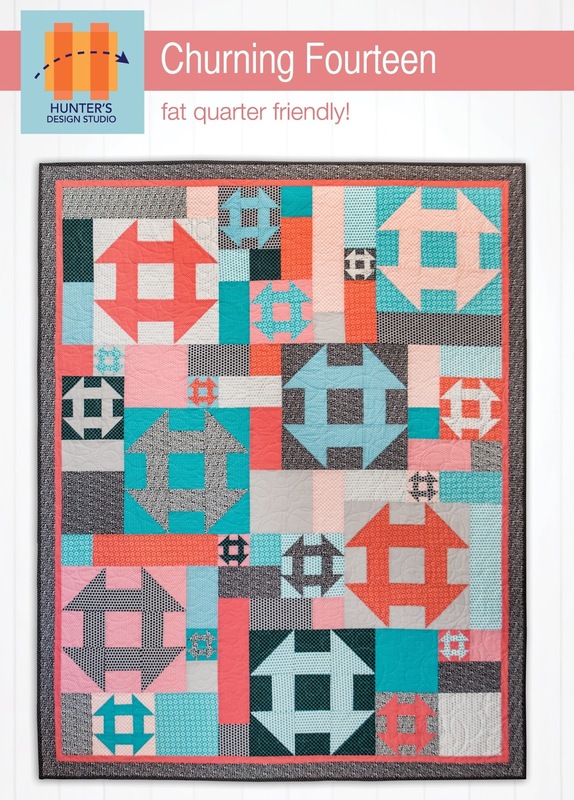 I love the color combinations and the way I could buy many smaller pieces for my scrap quilts. The bundles are so very cute. And just look at the packaging. It’s so pretty I hated to have to open them. But of course, I did open them. In fact, I couldn’t wait to tear into them. I love the bundles. They are full of so many cute prints I look forward to using them in my Jen Kingwell quilts. I love Sudoku puzzles. They are quite the challenge. I’ve read studies where it’s been shown that doing these mind puzzles can help stave off Alzheimer’s. I sure hope that’s true because I love doing them and the bonus of thinking that I am exercising my mind takes away the guilt of spending time on them. I found a free pattern online called Simple Sudoku Quilt. The pattern is at Craftsy and you can get it here. To understand how it works you have to know the sudoku concept where the puzzles have the numbers 1 through 9 that appear only once in a row across and once in a column down and once in a 9-patch grid. And there are 9 9-patch grids that contain a set of the numbers. The way it works is you cut 9 squares of 9 fabrics, number each fabric 1 through 9, solve the sudoku and place the fabrics on the appropriate number from the puzzle. There’s no thinking about fabric placement, the solved puzzle does all the work for you. What fun! So here’s my sudoku quilt using gray fabric for the sashing to distinguish the 9-patch grids and some nice bright fabric on for the back. I had a great time putting this together and it was the first quilt top I completed at the quilt retreat I attended a few weeks ago. All that is left to do now is to put a Quilts for Kids label on the back, wash it and send it off to the charity. I think I will make many more of these when I need a simple pattern for a quilt. My wonderful husband built a bunch of bird houses for me last fall. Over the winter, I painted the bird houses and sealed them with some environmentally friendly paint products. I wished we had a better spring so these could have been installed earlier but the last month has been pretty terrible. So it took until yesterday to finally get these little cuties up! I made the Reveille quilt top at the quilt retreat last weekend and today I finished quilting and binding it. It is a cute little baby quilt that measures 31 1/2" x 31 1/2". It's a great baby quilt and a great use of some of my charm packs I've had saved. 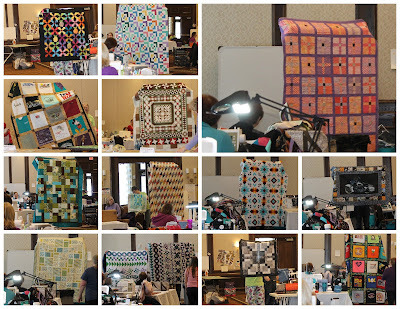 I had the opportunity to attend a quilt retreat at the Osthoff Resort in Elkhart Lake, Wisconsin this past weekend. The craziest thing happened that had never happened before. An April snowstorm hit the state like never before. There was so much snow that we had to stay until Monday just to get out of town. Ironically, back home in Oak Creek, we had just a few inches of snow fall during this storm. I can't complain, the resort was gorgeous, even covered in all that snow. So this retreat was the first one I've ever attended. I was invited by a fellow quilter that I worked with over at Coins and Quilts. She never attended a retreat either, so I wasn't going to get much advice. The retreat coordinator email everyone an instruction sheet which helped greatly. I followed the instructions to a tee, including bringing my own chair. That was a tough thing to do since I drive a Mini Cooper. My car was packed so tight I had very little wiggle room. As for me, I completed 3 entire quilt tops. We all had an opportunity to pick a door prize and I chose a fabric bundle with matching thread. The theme of the retreat was 'quilt university' so at the end of the weekend we all got our quilting 'diplomas'. The entire weekend was great fun. I met some wonderful people and I would love to have another opportunity to do a sewing weekend with them again. The retreat was sponsored by Ben Franklin Crafts in Oconomowoc, WI and I have to admin, I've never been to the store. I now feel compelled to drive out there to check it out. I completed a second outer space themed quilt using one of the three cute galaxy panels I have on hand. For this one I used a bright sashing around each block to make a cheerier version of an outer space quilt. I will save this quilt for my granddaughter's best friend who just loves the planets. I haven't had much time for sewing lately. I am prepping to attend my first quilt retreat. Over the last few weeks I've struggled with what to bring along. Since I'm new to a retreat, I did some online research as to what to expect. The first thing I took note of was that it is suggested that you cut all your fabrics before you go so you are ready to just sew. That was helpful to know, but I still didn't know what projects I would bring. Then over the weekend, I just had this crazy notion; don't try to complete projects that are already started, just start fresh. So I dug out some of the patterns on my 'want to make' list and matched up fabrics to go with them. It was so fun. Since I worked in a quilt shop, cutting quilt kits was something I am comfortable doing. I went crazy pulling fabrics, cutting, and prepping everything into individual kits. After a few days of prepping, I had 7 kits ready to go. I am certain that is overkill but I have to say, it was a liberating process knowing some of my favorite fabrics were going to get used up. Before I cut these kits, I was sort of paralyzed as to what to pack. Now that I know what I will be sewing, the packing part has become much easier. I know what size blocks I will be squaring up so I know what size rulers to bring, what color threads to bring, and everything else is falling into place. So my lesson learned was to pick the projects, then pack the supplies and equipment. After all that cutting, my garbage bin sure looks pretty - ha! I have a single bin with these pretty, old-fashioned, not-exactly-my-style, quality, cotton floral fabrics. I would love to use them up just because I'm sure I could donate a finished quilt to church and someone would enjoy it. While wasting time on Pinterest, yes, I admit it, I found some finished High Five quilts. The High Five pattern can be found in Amanda Jean Nyberg's book, Sunday Morning Quilts and I own that book. It felt like a perfect way to use up the pretty pieces of floral fabrics. I started to make the cute little blocks but didn't get as far as I had hoped. I had much prepping to do over the last week to get ready for Easter dinner. We hosted today's dinner which was hard work and rewarding. Everything turned out great and it was fun to have the family all here. I did most of the food prep in advance to make the day easier and I did cut a few corners, like the Simma's cheesecake. There are none better...unless my sister is baking. Her cheesecakes are the best but I really wanted her to not have to do any of the work for today's dinner.